Although they span the area between the avant-garde and the neo-avant-garde, the film and audiovisual activities of José Val del Omar have taken place in the territory of myth. Myth as something situated outside of history, that only leads to cult status. A situation that generates attractions or extreme fascinations, but that avoid contrasts and relationships. Archipelago Val del Omar is a film and lecture series that searches for these contrasts, in an attempt to understand the author of Fuego en Castilla in a new singularity, not in terms of isolation and exceptionality, but rather of crossroads and recognition in a history woven of fragments, glimpses and asynchronies. This exceptionality is one of the characteristics that has most determined the way we comprehend and study the work of José Val del Omar. Behind the amazement at his work, which is often called insular , hide stereotypes about the artist and Spain: an ostracized genius during the times of Franco or a baroque mystic in the realist tradition. This series of films and lectures seeks to challenge such assumptions, presenting Val del Omar as a filmmaker born within the international documentary movements that arose in the 1920s-30s, who identifies with its reform and revolutionary inclinations, who shares the compulsive attraction for beauty and the ecstatic phenomena of surrealism, who understands flamenco as another type of primitivism, transplanted into modernity from its very roots, transforming it in excess, movement and loss of limits, and who, in the end, conceives of the cinematographic mechanism as a collective body and experience in overflow, the opposite of what others call expansion. Incorporating the gaze of anthropologists, text theorists, art and film historians into each of the sessions, this series attempts to multiply the singular, turning the insular model into an archipelago . Session 1. Documentary and social pedagogy , 1930-35. Film-Train and the Pedagogical Missions. Documentary and social pedagogy, 1933. In the anonymity of collective work, the Pedagogical Missions (an initiative undertaken during the Spanish Republic, aimed at educating the rural population through film) and the experience Kinopoezd [Film-Train] shared an educational purpose with the aim of producing a series of images and documents that would establish a two-way exchange of knowledge about the other – from urban settings to rural settings and vice versa–, and also of transmitting ideology through the culture and values advocated by the Spanish Republic, in the case of Spain, and by the Bolshevik Revolution, in the Russian context. The lack of declared authorship in the fragments shown does not take away from the prominent role of two specific personalities: Val del Omar in the Missions and Medvedkin in the Film-Train experience. The assumption by both of the didactic and mobilizing function of film is the backbone of their filmographies and writing. Val del Omar . Misiones Pedagógicas: Estampas 1932 , 1932. 35mm, 11´. Courtesy of Instituto Valenciano del Audiovisual y la Cinematografía "Ricardo Muñoz Suay," Valencia. Chris Marker . The Last Bolshevik , part 1, 1993. Film transferred to video, colour and B/W, original version with Spanish subtitles, 60´. Courtesy of Intermedio, Barcelona. Monologue by Alekandr Ivanovich Medvedkin , taken from Chris Marker. Le Train en Marche , 1977. Film transferred to video, B/W, original version with Spanish subtitles, 17’. Courtesy of Intermedio, Barcelona. Session 2. Vibration of desire, 1935-40. Cinegraphies and avant-garde. Joseph Cornell. Rose Hobart. Film, 1936-39. Vibración de Granada was made by Val del Omar outside of Pedagogical Missions. This short film, his most personal piece up to that time, is a portrait of the Alhambra and a look at the city of his birth. 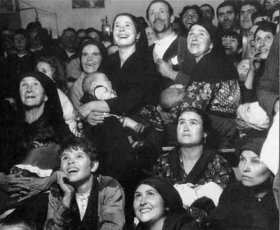 The film marks a shift towards the poetic documentary, the results of which he would later call cinegraphies or elementals. In Rose Hobart, Joseph Cornell re-edits East of Borneo, a 1931 drama directed by George Melford, starring Rose Hobart and Charles Bickford. With this film collage, Cornell subverts the meaning of the original screenplay so as to build a film through continual ellipses, in which shots are not continuous and have no narrative line but still have a final result that is surprising in its new meaning. Not only do Cornell and Val del Omar share avant-garde film resources, they both also have a fixation with desire in the gaze. Val del Omar . Vibración de Granada , 1934-35. 16mm, B/W (screened with green filter), no sound, 21’. Courtesy of Archivo María José Val del Omar & Gonzalo Sáenz de Buruaga. Joseph Cornell . Rose Hobart , 1936-39. 16mm, B/W with blue tone, sound, 17’25’’. Courtesy of Light Cone, Paris. Session 3. Other primitivisms, 1953-55. Flamenco and the image in movement. Marie Menken. Arabesque for Kenneth Anger. In the 1950s, Val del Omar takes film experimentation to an extreme, both at the technical level and in terms of form and content. In its formal experimentation, his work is similar to that of the generation of film poets active in post-war U.S., such as Kenneth Anger, Stan Brakhage and Marie Menken. 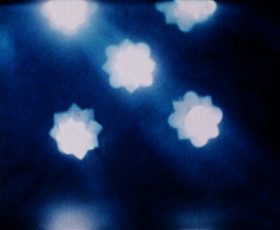 This session is intended to highlight the use of the film craft as a vehicle at the service of mystical reflection, of meditation on representation and the search for popular roots in the work of the Granada-born artist, who has a nexus with this generation, through the film made by Marie Menken in the Alhambra, Arabesque for Kenneth Anger . The reflection on representation and the idea of ballet, which are the foundations of Fuego en Castilla , engage in a dialogue with the film Bailes primitivos flamencos , edited by Vicente Escudero, whose tapping of fingers and nails are one of the elements of the Fuego en Castilla soundtrack. Marie Menken . Arabesque for Kenneth Anger , 1958-61. 16mm, colour, sound, 4’. Courtesy of Light Cone, Paris. Val del Omar . Fuego en Castilla (TáctilVisión del páramo del espanto) , 1958-60. 35mm, B/N y colour, Dolby SR sound, 18’. Courtesy of Archivo María José Val del Omar & Gonzalo Sáenz de Buruaga. Vicente Escudero and Herbert Matter . Bailes primitivos flamencos , 1955. 16mm film transferred to video, B/N, sound, 16’26’’. Session 4. Cinema as experience: overflows and expansions, 1960-1980. Peter Kubelka. Adebar. 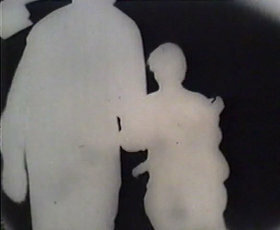 Film, 1956-57. The screening of Acariño galaico together with a film from the structural film movement, Kubelka's Adebar, underlines the similarity of their formal approach to the visual experience but also a shared attempt to enter a mental state that leads to static time, time that is endless . Recent readings of the work of Val del Omar associate his work with what is known as expanded cinema, a trend that developed in the 1960s and 1970s. The term was coined by the filmmaker Stan Vanderbeek in 1966. Years earlier Val del Omar foreshadowed a cinema that expands or overflows in a synesthetic quest. A cinema of experience, one that is physical, beyond vision, converges in Val del Omar's final years in the PLAT (Picto Luminic Audio Tactile) Laboratory, which has a surprising proximity to Stan Vanderbeek's Movie-Drome project in New York. Val del Omar . Acariño galaico (de barro) , 1961-1981-82, 1995 (Javier Codesal). 35mm, B/W, sound, 24’. Courtesy of Archivo María José Val del Omar & Gonzalo Sáenz de Buruaga. Peter Kubelka . Adebar , 1956-57. 35mm, B/W, sound, 3’. Courtesy of Light Cone, Paris. Val del Omar . Variaciones sobre una Granada , ca. 1975. 35mm, colour, no sound, 3’. Courtesy of Archivo María José Val del Omar & Gonzalo Sáenz de Buruaga. Val del Omar . Ensayos PLAT , ca. 1975-81. Selection of filming done in super-8 transferred to video, no sound, 3 sequences, each lasting 4’. Digital editing by Eugeni Bonet. Stan VanderBeek . Panels for the Walls of the World , 1967. Vídeo, b/n, sonido, 7'57''. Stan VanderBeek . Symmetricks , 1972. Video, B/W, sound, 6'12''. María García Alonso is a professor of Anthropology at the UNED, National University of Distance Education. She curated the 2006 exhibition Las Misiones Pedagógicas (1931-36) . Jesús González Requena is a professor of Audiovisual Communication at Universidad Complutense de Madrid and the author of important studies on the threshold of film, psychoanalysis and text theory. Esperanza Collado is an independent researcher and programmer. Her doctoral dissertation was on the dematerialization of cinema.